Dr. John A. Kilpatrick, PhD, MRICS joined the February 23rd class to talk about the specialized valuation work his firm does. He was in NYC to look at a prominent brownfield site receiving interest in Queens. His company, Greenfield Advisors, is best known for doing crisis valuations of real estate and in particular environmental disasters. He covered some challenging real-property projects, which had some very big public policy implications. BP along with Andarko, Misui & Co are owners with multiple operators Transocean, Cameron, and Halliburton. The distributed nature of responsibility makes the valuation process of this enormous project even more complex. 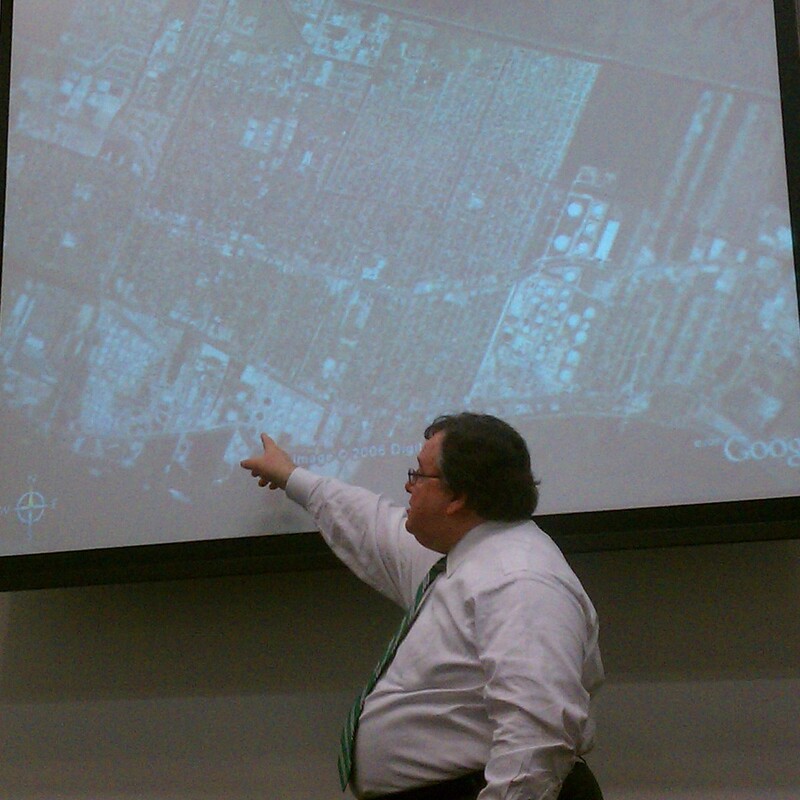 His group combined parcel data across affected areas from Texas to Florida. The valuation report is available in a web-base format. This tool provided immensely helpful to the public in understanding what was being done. Carmel Valley & Santa Lucia Preserve project. Moving on from some examples, Mr. Kilpatrick intoned his most admired philosophers, Bart Simpson and Albert Einstein. Albert Einstein, “if we knew what we were doing, it wouldn’t be research.” This quote has a lot resonance for me, but I wonder how to explain to clients, “I don’t know what I’m doing, I need to research it.” Maybe Mr. Kilpatrick will share some of his proprietary approaches in this area next time. The heart of valuation served as the next topic. He discussed the traditional method — Sales Adjustment Grid (a heuristic model) in comparison to OLS/WLS, hedonic regression. The latter has great statistical confidence, but on the individual level, they are very expensive to operate on the granular level. In between these two models, is where a finer, yet less expensive methodology — bayesian estimation & Maximum Likelihood Estimators (MLE). damage by the oil that spilled on top of that. Another twist was the type of water (i.e. brackish or salt) that caused the flooding. Brackish from Lake Pontchartrain meant on type of compensation and salt water meant another. I wonder if that interesting site in Queens will pose such challenges.